Hey guys! I've noticed there are lots of Pedaltrain users here. I'm a happy camper with my Pedaltrain Jr and yet I'm still motivated to get a Pedaltrain-mini or a Pedaltrain Nano due to their great quality & design of their products! I am also curious on how people are utilizing the space on their Pedaltrain, if you got one - post em here! Let this be the a share thread for all Pedaltrain users! Originally, I was eying the Pedaltrain II since I had 10 pedals for my board and I wanted to make sure I would have enough space to set them up. But with the help and inspiration from Turi (for the Tetris arrangement) and Bart (for setting-up the underside neatly), I found my way to it and settled on the Pedaltrain Jr. Thankfully, I was able to maximize the space I needed. Thanks bro It was your Pedaltrain Jr that inspired me a lot! Please share yours here too! san mo nakuha yang copy mo sir? pm me the price and dimensions.. Thanks, man. 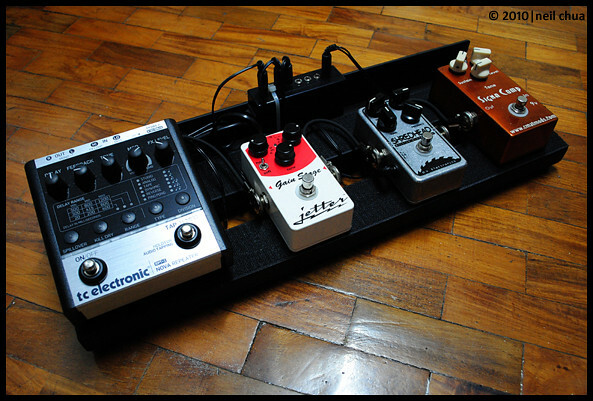 That's an awesome looking pedalboard. My PT Mini is status quo. I sold the Timmy yesterday. More GAS money, hehe. Bili ka na din ng pedal board mo men...madali mag5S. Think gaia always!! Gaiahin naten setup nila. whoa! nice rig you got there, DINOSAUR!!! The Signa Comp's gone though.. I'll replace it with a chorus within the next few months..
How's the MXR Black Label Chorus? I'm planning to get one. Either that or a Danelectro Cool Cat Chorus. ^Love it. Very full-sounding chorus, very organic and tweakable. And for the price, nothing can touch it. Okay. I'll save for that. great thread and great board Rob! 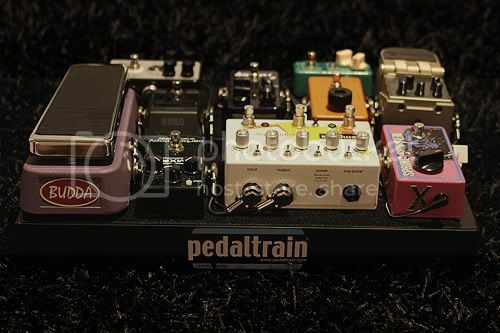 about time GC had a pedaltrain thread! so far i'm happy with my copy! but if i had extra dough, i might go for the real thing. the thing is, the PSU i use (Pedalmax) doesn't fit the underside of the Pedaltrain JR. Thanks Francis It wouldn't be as tight and neat without the concept and design of the Pedaltrain to it, I really like the fact you can put your PSU underneath and keep the wires and patch cables tidy. And the real fun part is putting it all together! I'm pretty sure once you get your Pedaltrain, it will compliment your beautiful guitars and amps very well. Thanks Bart Your pedalboard has always been a big influence to most of us here. Hey you sold the Timmy? 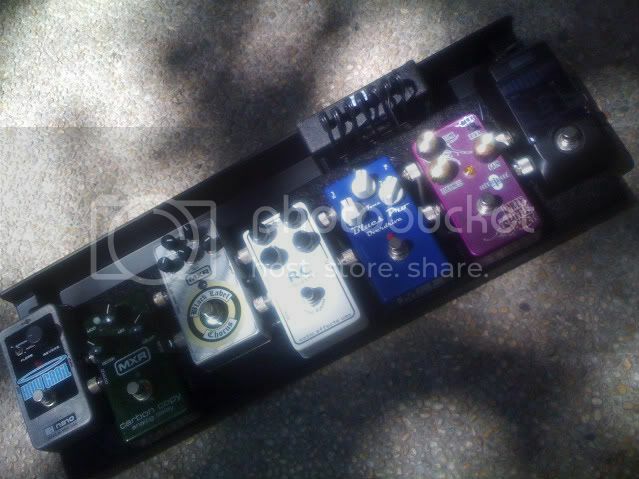 Anyway, nice board as always - I really like how you maximized your space by using a wah probe on a Pedaltrain mini. I want your Ekko 616 too! @ Maxi - Thanks bro! 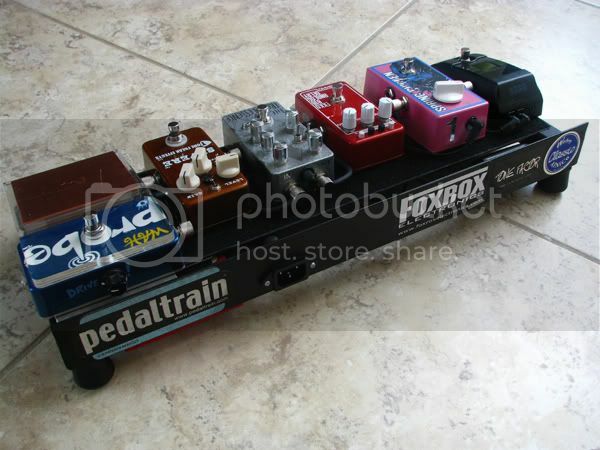 Pedaltrain has certainly monopolized the pedalboard scene for the past years in most forums online. As for the PSU.. Mine had no problem fitting underneath. If I'm not mistaken voidmain was also able to mount his PSU underneath. agree with you 100%. they are very neat-looking above and underneath. my PSU is locally-made Pedalmax. it won't fit since the PTJR's height is only 2". my copy is 3.5" to accommodate the PSU. I can measure the clearance on mine to double check. Maybe Emil can help/modify your enclosure to make it fit underneath? you better stop it now...you will have me GASsing. anyway, there will come a time when i can post a real pedaltrain here. for now, i would have to abstain. Bad Behavior has blocked 41915 access attempts in the last 7 days.